If you would like us to link to your site, please email us. We'd be happy to consider it. Ethos: Saltaire Village website exists to serve the people of Saltaire and to provide information to a global community. Its aim is to be inclusive, friendly, helpful and informative. If you have business, service, community or social interests in Saltaire and you would like to contribute to this website, please get in touch. Saltaire resident and local bard, Eddie Lawler’s website. Here you will find information and examples of his work - songs, poems and musicals - and forthcoming events. You can also order Eddie Lawler CDs and books from his site - and get in touch with the man himself. A great venue if your passion is Real Ale and a civilized yet charmingly convivial atmosphere! The Half Moon Cafe is located in a Grade 2 listed building originally built by Titus Salt for the use of Saltaire Cricket Club, in the wonderful setting of Roberts Park. It is open throughout the year, selling quality coffee, teas, ice cream and a range of home made hot and cold dishes. The Half Moon Café is run by Saltaire Cricket Club. Most staff give their time voluntarily and the equivalent of their pay is donated to the running of the Cricket Club. This is Diners' Club and a range of interesting events are hosted in the café throughout the year. A really smart and thoughtful website - well worth a visit. Friends Of Saltaire Primary School ('FOSPS') is a registered charity with the objective of raising funds through events and activities to provide extra facilities for the school. Hammonds Saltaire Band, previously YBS and Yorkshire Building Society Band has been one of the most successful of all contesting brass bands in the last twenty years. The band has an unbroken sequence of 73 years under various names, with roots going back 150 years to when, in 1855, the band was formed as one of the amenities for the people of Saltaire. but is now based in Saltaire. 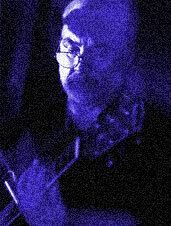 Mike has played a number of gigs at Fanny's Ale and Cider House and the Cricketers in Keighley recently, and would welcome like to make contact with local blues musicians. This site is wonderful with poignant and artful images and words. Saltairy Tales, a musical by local bard and Saltaire resident, Eddie Lawler, was premiered at the Saltaire Festival in 2005. Saltairy Tales II will be performed at the 2006 Festival. match lengths in use etc. A cracking, impressive website giving all the latest about Saltaire Cricket Club - top batting averages, most runs, most wickets - all their fixtures - and much more! Saltaire Cricket is great to watch in Roberts Park. Saltaire Cottages offers lovely holiday accommodation and short term lets in the heart of Saltaire. You can view the properties and make your booking request on-line. This website gives a full itinerary of the fourth Saltaire Festival which runs in September from the 7th to the 17th. The festival has become an annual event and is organised and run by local people who do an incredible job of making it a wonderful occasion for locals and visitors. Really worth putting in your diary. SaltaireLive - brings the best in Celtic & Folk music to Victoria Hall in Saltaire. Saltaire is on the edge of Shipley, 10 mins by train from Bradford and 20 mins by train from Leeds. 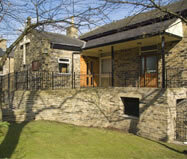 The hall is on Victoria Road, only a minute's walk from Saltaire railway station and Salt's Mill. The Saltaire Methodist Chuch is on Saltaire Road. It is well used by the community as a meeting place for choirs, societies and children's birthday parties. The original church was opened in 1868 and was the only church permitted within the village by Sir Titus Salt besides the Congregational Church opposite Salts Mill. The URC has its own website with everything you need to know about this interesting and beautiful church. Bell ringing is a fascinating, enjoyable, social and skillful team activity which does not require an ability to read music or, indeed, great strength. Ringing can give a lifetime of enjoyment so, whatever your age, come along and give it a try - you will be made most welcome. Salts Mill has its own NEW and BEAUTIFUL website. It is a fantastic place to visit and is open every day of the year except Christmas, Boxing Day and New Years Day. It houses the art work of David Hockney, has a great cafe restaurant, and sells books and tons of other things. A lovely place to spend an afternoon browsing. Amazingly, entrance into this beautiful building is FREE. Shipley College isn't in Shipley - it's in the heart of Saltaire and has several buildings around the Village. The Resource Centre, which houses artefacts of Saltaire from Sir Titus Salt's time is in the Exhibition Building on Exhibition Road. Visit this authentic and charming website and find out all about Shipley Glen Tramway's history and its events and running times. Local historian, Clive Woods, is often here - and so is the Tramway museum. Children will love it and it saves tired legs on the climb up to Shipley Glen. The local party for Saltaire is the Green Party. The National Accordion Championships are to be held on 24th February 2007 at Victoria Hall, Saltaire. The festival will include a Gala evening with jigs, waltzes and reels. The site gives up to date info and has an entry form. We're based in Baildon though we meet every Sunday in the Salt Grammar School car park at 10:00am. The Sunday session is especially aimed at beginners and improvers. Whilst we do have a competitive side to the club, the main ethos is all about enjoying running in the fresh air. We also have a strong social side. Bradford CHA Rambling and Social Club Established in 1903.You are welcome to try a couple of walks before joining. A small and very friendly group, we have a programme of walks arranged for every Sunday and most Wednesdays. We walk in the Yorkshire Dales, South Pennines and in Lancashire, the rambles averaging 9 - 11 miles on Sundays and 6 - 8 on Wednesdays. During the winter we hold fortnightly lectures/ socials and at least once a year, we have a midweek break, often at an HF house. Our rehearsals are on Saturday mornings at Cottingley Village Primary School, BD16 1SY. We go on UK and European Tours, have a social calendar, besides playing concerts. Skipton is an historic town 15 miles North West of Saltaire and really worth a visit. Their local website is great - packed full of information, brilliant photos, impressive webmastery and a discussion forum. Add it to your favourites. Explore the beautiful Yorkshire Dales - Saltaire is one of the stops on the way. The Metro website is really helpful if you rely on public transport. Saltaire is a designated World Heritage Site. UNESCO stands for "The United Nations Educational, Scientific and Cultural Organization". It exists to "encourage the identification, protection and preservation of cultural and natural heritage around the world considered to be of outstanding value to humanity." Saltaire is described on the UNESCO site, along with all the other World Heritage Sites. For a full list for World Heritage Sites, click here. To go directly to the Saltaire description, click here. Shaun and Julie are Alpaca Farmers who are right on our doorstep in West Yorkshire. They also run the Yorkshire Alpaca Society. For all your alpaca needs - sales, advice, welfare - contact County Alpacas. Find out more about alpacas and alpaca wool products.This is a five acre farm in Clinton, Connecticut run by Pattey and Jim Bleecker, devoted to the breeding and nurturing of an alpaca herd. They even mention Sir Titus Salt! These lovely people were the first to link back to this site. Thank you Pattey and Jim.